At Biel Foreign & Domestic Repair & Service we work on all makes models, imports and domestics. We aim to be your dealership alternative for Factory Scheduled Maintenance in Prescott, AZ. If you want your car, truck, SUV or hybrid operating at its peak level of performance for years to come, bring your vehicle into Rich Biel and his Tech’s and have it looked at. We pride ourselves on providing you with the most efficient and cost effective way to keep your car on the road. One of the best ways to keep you car reliable is to adhere to your Factory Scheduled Maintenance program outlined in your owners manual. There, you’ll find your manufacturer’s suggestions for maintenance based on specific mileage markers. Can’t find your owners manual? Not a problem, when you bring your vehicle to we’ll look up your manufacturer’s maintenance recommendations based on your current mileage and compare that to the condition of your vehicle. Then we will review our findings with you in order of importance. We know how important your car or truck is to your daily routine and that’s why we’ll work with you to avoid unnecessary roadside breakdowns. 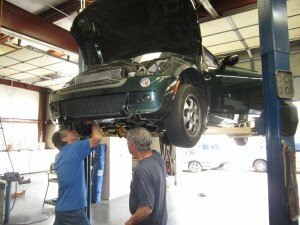 We know that no one looks forward to auto repairs in Prescott AZ and that’s why here at Biel Foreign & Domestic Repair & Service we believe in communicating with our customers to start a long lasting relationship. We will get to know your vehicle with every visit; keeping your car, truck or SUV safe and reliable for as long as you own it. That’s why all our repairs are backed by our 12 month / 12,000 mile warranty for your peace of mind. Is your car feeling sluggish or have you noticed a drop in all over performance? It’s time to let Biel Foreign & Domestic Repair & Service have a look. Not everything triggers your check engine light and it’s better to catch issues while their manageable before they become larger, and more costly problems down the road. Our Techs are proficient in all makes and modelswhether they are imported or domestic, and Rich Biel works hard to be on top of the automotive industry. This includes our technicians who have years of experience and helpful attitudes that set Biel Foreign & Domestic Repair & Service apart from any other auto shop. We are fast, friendly and convenient.